Marketing is the central hub for providing support to all 377 FSS/MWR programs, services and events. The primary goal of the Marketing Department is to increase awareness of programs and services available to all the military service members, their families, retirees and DOD civilian employees as well as event support and public relations. We provide assistance with publicity, photo support, prints and web for the 377 Force Support Squadron. Get Up Next Delivered at Home! Expand your brand awareness with Force Support sponsorship, donation and advertising opportunities! Through the Air Force Commercial Sponsorship and Advertising Program, you can reach a dynamic market of more than 100,000 locally to 2 million worldwide. Our total force includes active duty military, guard, reserve, retirees, civilians, contractors and family members with an area of responsibility that spans the globe. Air Force customers are well educated and brand loyal with a combined buying power of $30 billion a year worldwide! With Kirtland, our local communities benefit greatly from our share of this buying power. 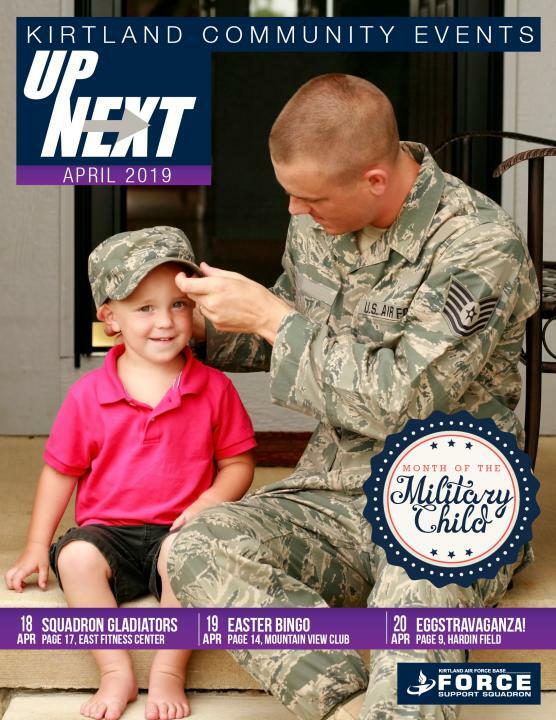 The Air Force Commercial Sponsorship and Advertising program, in conjunction with the programs of the 377th Force Support Squadron, is the only authorized way to reach these customers. Each month the 377th Force Support Squadron personally welcomes new arrivals to the base community, introducing them to recreational activities and support services on base and in the local community. Let us introduce YOU to them and develop a strategy to help us both MEET OUR OBJECTIVES! You can sponsor quality fitness and sporting events, club promotions, golf and youth programs, by providing financial support or a combination of cash and in-kind products or services to enhance the overall program. Benefits will be commensurate with the level of support provided. Our goal is to provide the Kirtland community with top quality programs with our largest events. Sponsorship, donations and advertising fess help finance enhancements to the programs of these Force Support activities, including events open to the public. Exposure you can count on! MILLIONS of customers visit Kirtland’s recreational facilities and participate in our programs annually! Plus, we have direct access to ALL newcomers – military and civilian. Through sponsorship you can be part of the experience every time we open our doors! Don’t let this opportunity fly by! Sponsorship opportunities are limitless. Call us with your ideas and we will customize a package to meet our mutual needs. Contact Kirtland’s Marketing Director, Matt Montano at 505-846-1644 now!